The Six Flags New England amusement park is located in Agawam, on the banks of the Connecticut River. Agawam's ZIP code of 01001 is the lowest number in the continental United States (not counting codes used for specific government buildings such as the IRS). The Indian village originally sited on the west bank of the Connecticut River was known as Agawam, or Agawanus, Aggawom, Agawom, Onkowam, Igwam, and Auguam. It is variously speculated to mean "unloading place" and "fishcuring place", perhaps in reference to fish at Agawam Falls being unloaded from canoes for curing on the flats at the mouth of the Westfield River. Ipswich, Massachusetts was also known as Agawam during much of the 17th century, after the English name for the Agawam tribe of northeastern Massachusetts. In 1771, John Porter moved to Agawam and founded a gin distillery nine years later. After he died, his grandson, Harry, continued to work the business as the H. Porter Distilling Company. The plant was sold in 1917, and during Prohibition, the main products produced in the building were potato chips and cider. After the Volstead Act was repealed, the mill began producing gin again but closed permanently in 1938. The building, on Main Street near River Road, served as Agawam’s Department of Public Works garage until it fell into disrepair. The original town hall, built in 1874 at the corner of Main and School Streets, housed the town government divisions as the current one does today, as well as the original town library located in the building’s Tower Room. A small school building was located near the premises and held grades one through three. The building was demolished in 1938, and the property is now the site of Benjamin Phelps Elementary School. The Feeding Hills town hall, built in 1906, was almost identical to the Agawam town hall and was located at the corner of Springfield and South Westfield Streets. The building was demolished in 1950, and the Clifford M. Granger Elementary School now occupies that land. May 29, 1930 and June 1, 1931 saw "grand openings" of Bowles Agawam Airport with the latter date including a visit from 100 biplanes of the United States Army Air Corps Eastern Air Arm. A scheduled air service operated out of Bowles for approximately one year, before ending. The airport continued to operate as a civil airport until circa 1985. A pari-mutuel horse racing track, including grandstand and stables, was built adjacent to Bowles Airport. Seabiscuit won the Springfield Handicap at Agawam in track record time in October 1935. The racetrack operated until pari-mutuel betting was outlawed by referendum in Hampden County in November 1938. The airport also had plans in the early 1960s to become a commercial airport and host airlines for the city of Springfield, but plans were shelved. The airport and racetrack were demolished in the late 1980s and the area is now an industrial park. 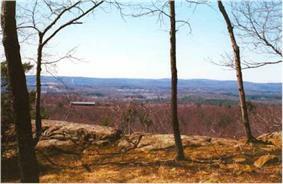 Agawam is located at (42.071961, -72.644097). The city borders West Springfield, Massachusetts, to the north, Southwick, Massachusetts, to the west, Longmeadow, Massachusetts, to the east, Springfield, Massachusetts, to the northeast, and Suffield, Connecticut, to the south. Westfield, Massachusetts, also borders to the northwest. In the city, the population was spread out with 22.1% under the age of 18, 6.5% from 18 to 24, 29.7% from 25 to 44, 25.1% from 45 to 64, and 16.7% who were 65 years of age or older. The median age was 40 years. For every 100 females there were 90.5 males. For every 100 females age 18 and over, there were 86.9 males. 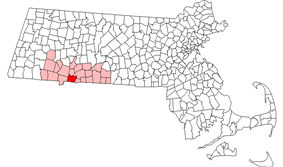 Agawam is one of fourteen Massachusetts municipalities that have applied for, and been granted, city forms of government but wish to retain "The town of" in their official names. A mayor is the elected leader of the city. The city council consists of eleven members elected at large by the voters and is the legislative branch of the town government. Agawam is in the Massachusetts 2nd Congressional District and the First Hampden and Hampshire Senate district. 1801 - E. Porter Peppermint distillery, later to become the "Agawam Gin" distillery. 1810 - A cotton mill was erected on the site of present-day Six Flags New England. 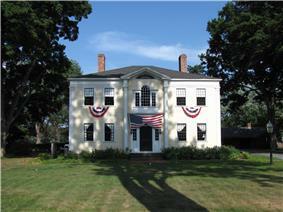 1812 - Agawam Woolen Mill was established on Elm Street. After a fire, the building was rebuilt in brick in 1889 and still exists. The Agawam Woolen Company folded in 1949. 1952 - Stacy Machine Co, came to a new plant located on Main St, is best known for producing specialized printing presses. Later known as Kidder-Stacy, the plant closed in the 1990s, but the Main St plant still stands. 1953 - WWLP an NBC affiliate television station began operation with studios and transmitting facilities on Provin Mountain in Feeding Hills. 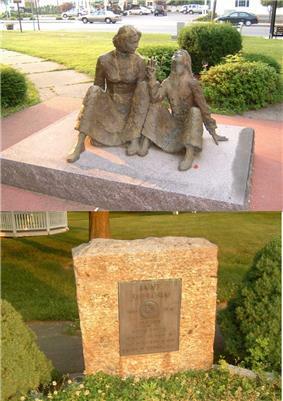 Anne Sullivan Memorial - marker and statue dedicated to Helen Keller's "Teacher", born in Feeding Hills. The memorial is on the corner of Springfield and South Westfield Streets. Creighton Abrams, who commanded military operations in the Vietnam War. Daxe Rexford, lead guitarist for Pajama Slave Dancers. ^ Constantine, Sandra. "Agawam Mayor Richard Cohen seeks to fend off former state Rep. Rosemary Sandlin so he can win 6th term". MassLive. Retrieved 17 September 2015. Cohen, a Democrat, has painted himself as a fiscal conservative who always comes up balanced budgets with little fat for the City Council to trim. ^ "Office of the Mayor". Town of Agawam, Massachusetts. Retrieved 17 September 2015. ^ "United States Postal Service Facts". ^ "1980 Census of the Population, Number of Inhabitants: Massachusetts" (PDF). US Census Bureau. December 1981. Table 4. Populations of County Subdivisions: 1960 to 1980. PC80-1-A23. Archived (PDF) from the original on 21 July 2011. Retrieved July 12, 2011. ^ "1950 Census of Population" (PDF). 1: Number of Inhabitants. Bureau of the Census. 1952. Section 6, Pages 21-10 and 21-11, Massachusetts Table 6. Population of Counties by Minor Civil Divisions: 1930 to 1950. Archived (PDF) from the original on 21 July 2011. Retrieved July 12, 2011. ^ "1870 Census of the Population" (PDF). Department of the Interior, Census Office. 1872. Pages 217 through 220. Table IX. Population of Minor Civil Divisions, &c. Massachusetts. Archived (PDF) from the original on 9 June 2011. Retrieved July 12, 2011. ^ "1860 Census" (PDF). Department of the Interior, Census Office. 1864. Pages 220 through 226. State of Massachusetts Table No. 3. Populations of Cities, Towns, &c. Archived (PDF) from the original on 9 June 2011. Retrieved July 12, 2011. ^ "Town of Agawam, MA Mayor". Archived from the original on 12 December 2010. Retrieved December 2010. ^ "PAJAMA SLAVE DANCERS, DAMMIT!". snakefoot.com. Retrieved 20 October 2015. ^ "Perkins - Anne Sullivan". Perkins School. Retrieved July 4, 2014.